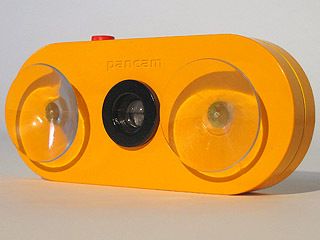 Pancam is conceived as a products in two parts. On the one hand a low cost digital camera records the journey of your choice. The camera has got two suckers on its front side so it can be attached to the window of a car, a plane or any other vehicle with a window. On the other hand a simple program takes the recorded sequence of image stripes and joins them to one long panoramic image. The program either detects an automatic setting for coherent assembly of the image or you can manually fine tune the "stiching" process in real time. Once the image is assembled it can be printed out on a roll of paper.